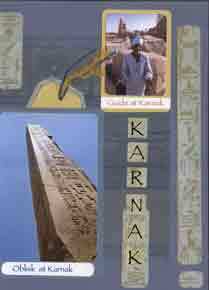 This is the cover page for my Egyptian Scrapbook Layouts. 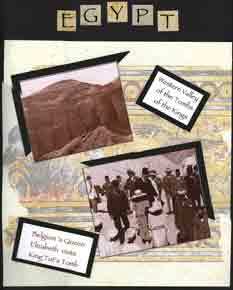 I used a black and white photo from the newspaper when the King Tut Tomb was discovered. 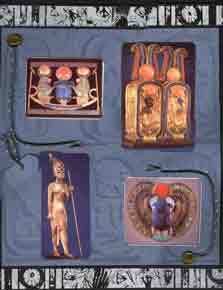 The Egypt Scrapbook was a large book 15" high and 12" wide. 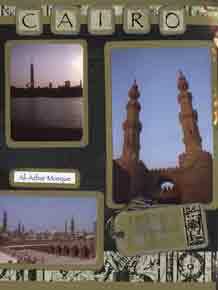 The pages in the book were all black and so many of them in these photos will appear with a black background. Also, because they were 15" tall, all pages will have a border on the top and bottom or across the middle to make the 12 x 12 scrapbook paper fit onto the 12 x 15 spaces. 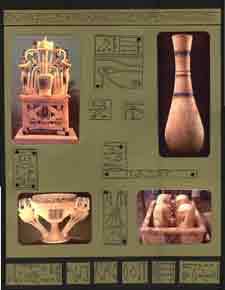 All papers used on the Egyptian Scrapbook Layouts were from the "Egyptian Kit" from Club Scrap.com as were most of the stickers and letter squares. A few of the embellishments were purchased separately from Scrap Your Trip.com and they also have Egyptian Scrapbook Papers to purchase as well. I hope these layouts will give you some ideas. 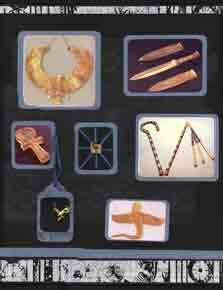 These Egyptian Scrapbook Layouts above use some heavy satin cording and some round glass drops as embellishments. 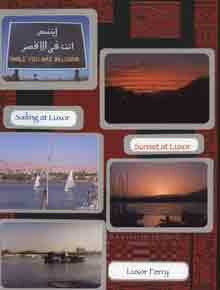 Some are glued directly to the page and some of the cording is also used in the tags. 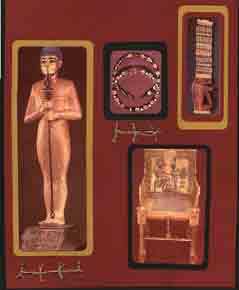 The journaling has not yet been done, but the intention is to discuss some of these items that were found in the Tomb of King Tut when it was opened. The journaling will go on the tags. 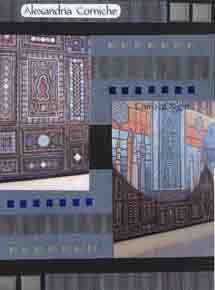 The main embellishment on the pages above was the gold metallic fabric used on the left. 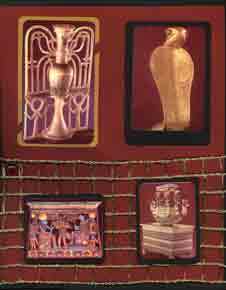 I am not sure where I got it, but since there was so much gold in the display of items from King Tut's tomb, I decided to use it. There are two small, left over pieces of the gold fabric on the layout on the right. 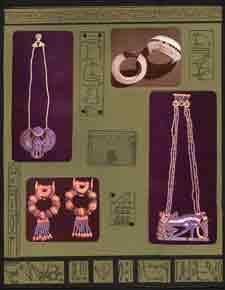 All of the Egyptian Scrapbook Layouts were on 12 x 15 inch Scrapbook Layout album pages but used 12 x 12 paper. I had to make borders on the top and/or bottom or piece the papers in such a way to "stretch" the paper. Sometimes, as here, I added sticker strips to the bottom and top. 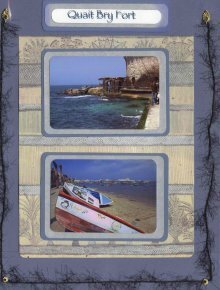 As you look through the rest of the layouts on these pages you will see different ways to use 12 x 12 inch paper on 12 x 15 inch Scrapbook Layouts. 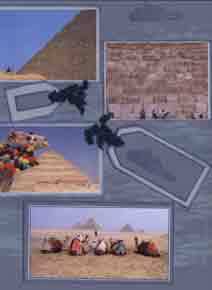 These two layouts from the Egypt Scrapbook above are a good example of the piecing needed to make the 12 x 12 paper fit onto a 12 x 15 scrapbook page. The black and white patterned strips were sticker strips that came in the kit and I also used 1/2 inch strips of paper ribbon to cover the seams of the pieced background. 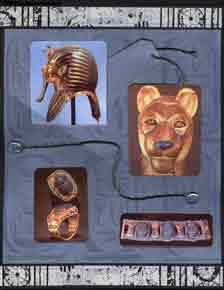 These olive green Egyptian Scrapbook Layouts above used a piece of olive card stock that was pre-printed with the Egyptian Hieroglyphics. I cut them into pieces and used them for the border accents. I also used them in various blank spaces in the layouts and attached them with black eyelets at the corners. For these layouts above, I cut the 12 x 12 paper across the middle and accented the black strip with a border sticker strip of the black and white pattern. 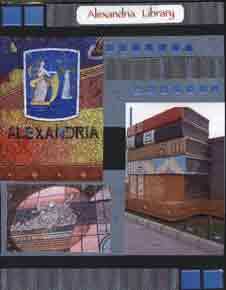 These layouts of the Alexandria Library have photos of the gorgeous mosaic work. I decided to carry the mosaic theme further and used some tiles I had that came in two sizes and three colors of blue to accent the paper. These tiles are a soft pliable plastic with adhesive on the back. 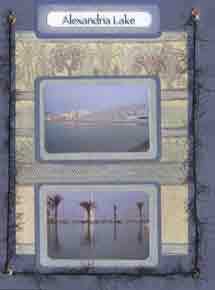 These two layouts above of the Alexandria Lake use a fuzzy fiber on the outside border, connected to the pages at the corners with a brad. 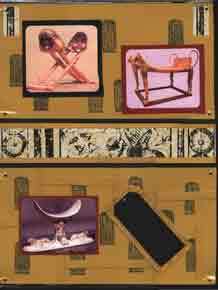 Fibers and Ribbons have become standard on a lot of Scrapbook Layouts, as you can see on the Scrapbook Ribbons and Scrapbook Fibers pages. 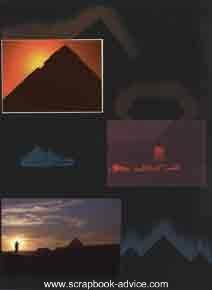 These layouts above have tags, some rubber stamped with an image of the Pyramids, and will be used for journaling. The blue chenille fiber is strung through the holes in the tags, it resembles the fibers that are attached to the harness of the camel. While Rubber Stamping first became popular with Card Makers, there are a lot of uses for them on Scrapbook Layouts. 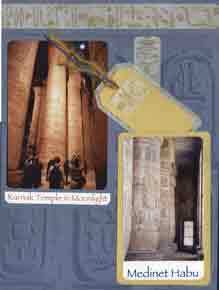 These Egyptian Scrapbook Layouts are very special to me. 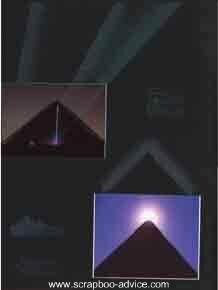 The pyramids at night were lite up with neon or strobe lights. I put the photos, with no mattes, directly on the black background and used my neon chalks to highlight the streaming light effects onto the background paper. 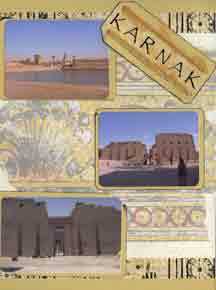 Scrapbooking Chalk can be used in many ways and there are several types available to purchase. 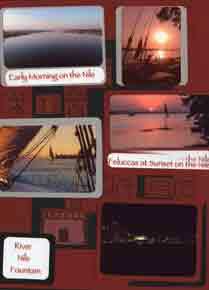 The layouts above use computer journaling in the same font as the letters that came with the kit. Sometimes these fonts are available for free, sometimes you may already have one on your computer that is the same or similar. For the perfectionist, if you know the name of the font, it can also be purchased - average cost $20 - $30 and downloaded to your word processing software. 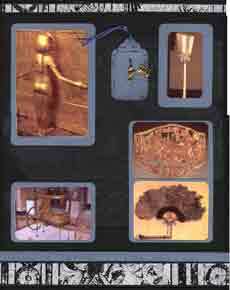 These gold layouts above used tags with lots of fibers to tell the location or the Page Title. 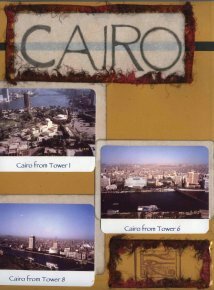 The font is the same font used throughout the Egypt Scrapbook for all titles and journaling. 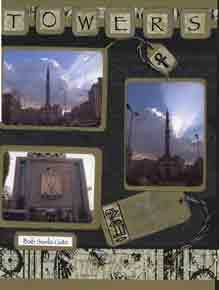 Again, using the letter squares for titling and tags with fibers for journaling. 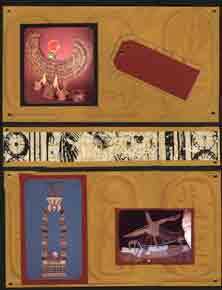 This page of Egyptian Scrapbook Layouts has a little of my personal art work. The "eye" which is used every now and then on these pages, was hand drawn copying a smaller version in a charcoal pencil. For the center of the eye, I used a round shaker box filled with gold and red beads of various shapes and sizes. 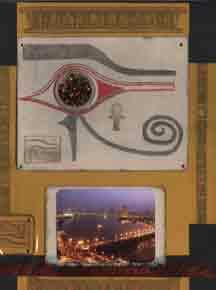 The titling block was also hand drawn to match the "eye" using the same charcoal pencil and attaching a red fiber border to frame "Cairo." I tried to copy the same font used for the rest of these layouts. Another use here of the sticker strips for top and bottom borders to "stretch" the 12 x 12 inch paper to use for 12 x 15 inch layouts. For the Title on this page, I used lettering stickers and put them on little squares to match the photo mattes and layered them on top of the border sticker. 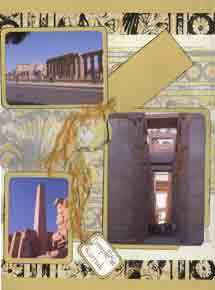 Hopefully, you have enjoyed these Egyptian Scrapbook Layouts and will be able to use some of the ideas for your own. In the meantime, Happy Scrappin'!